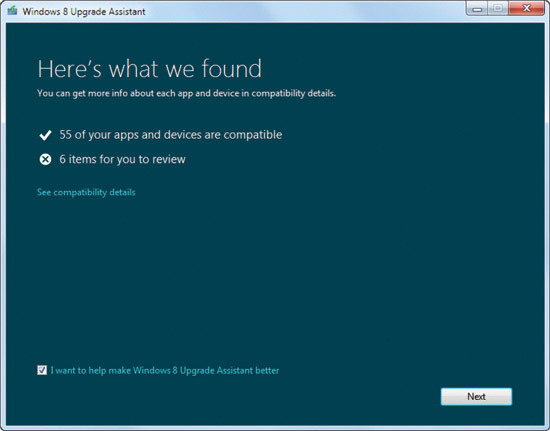 The Upgrade Assistant that’s part of the Windows 8 release preview can check your hardware and software for Windows 8 compatibility. If you’re considering deploying Windows 8, or even just want to run an extensive test platform, you can easily see if your systems will handle the new OS by running the free Upgrade Assistant. And you won’t have to go looking for it, because it comes with the release preview. Instead of offering a standalone upgrade advisor as in the past, Microsoft has bundled the new Upgrade Assistant into the actual setup for the Windows 8 release preview. Not only can you gauge your Windows 8 compatibility right off the bat, you can also install the OS on a test PC or create an ISO file to install it elsewhere. To get started, set up two or three test PCs outfitted with your current OS. For a full and accurate test, try to install as many of your organization’s supported applications as possible. Connecting some of your standard printers and other hardware will also aid in the compatibility testing. Fire up your browser and go to the Download Windows 8 Release Preview page. Click on the Download Windows 8 Release Preview button. You’ll download the Windows8-ReleasePreview-UpgradeAssistant.exe file. Run the downloaded executable file to immediately trigger the Upgrade Assistant. This will check your applications and hardware for Windows 8 compatibility issues (see Figure 1). This scan typically takes a few minutes. 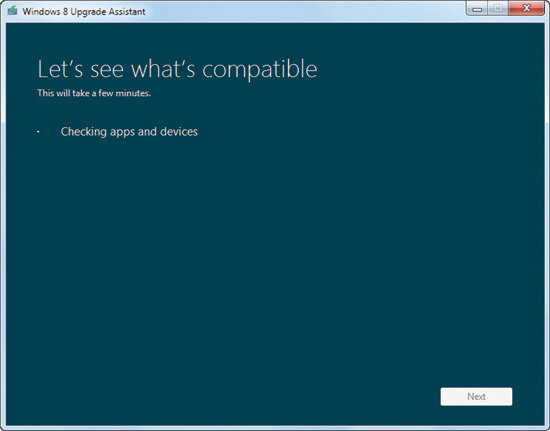 Figure 1 The Upgrade Assistant preview screen greets you as you start the scanning process. Once the scan is complete, the Upgrade Assistant will give you a quick summary letting you know how many applications and devices passed the compatibility test and how many you need to review (see Figure 2). Click on the “see Compatibility details” link to get the full picture. Figure 2 Following the initial scan, you’ll get a count of what’s compatible and what you need to review. The Compatibility details screen lists each program and device checked during the scan. It first displays the ones you’ll need to review, and then shows you the ones already compatible with Windows 8 (see Figure 3). Certain applications flagged for review might require an upgrade or reinstallation in Windows 8 for technical reasons. You might have to remove others and then reinstall them under Windows 8 for licensing reasons. A few might not be compatible at this point. Figure 3 The Compatibility details screen gives you more details on what you’ll need to do to ensure full compatibility. You can save and print the results of the Compatibility details screen. You can use this as you gather more information or retain it as an ongoing record. The Microsoft Windows 8 Release Preview FAQ can shed more light on the release preview. You can also check the Compatibility Center for Windows 8 Release Preview page for compatibility details on a wider range of products. 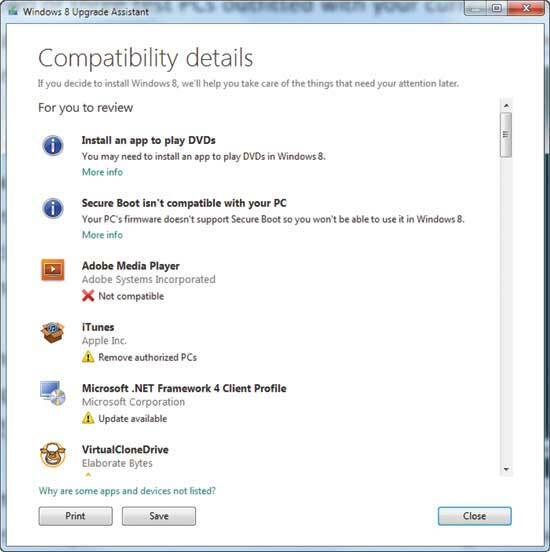 To install Windows 8 or create an installation package, close the Compatibility details screen. Then click Next at the “Here’s what we found” screen. This tool provides the product key for installing the Windows 8 release preview. Click Next to begin downloading Windows 8, but keep in mind this process usually takes a while. After you’ve fully downloaded Windows 8, an installation screen pops up offering you three choices (see Figure 4). You can install immediately, install by creating media or install later from your desktop. 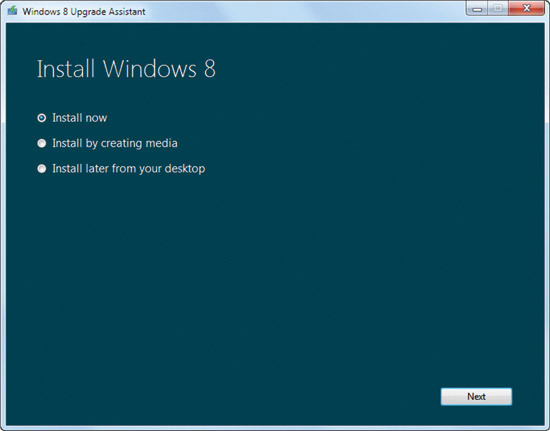 Install now upgrades your current PC OS to Windows 8. Install by creating media sends your Windows 8 installation to a USB stick or builds an ISO file so you can install it on other PCs. The install later from your desktop option puts an Install Windows shortcut on your desktop. This gives you the same three options to choose from at a later time. Figure 4 After scanning and downloading Windows 8, you’ll have several installation options. You can run the Upgrade Assistant under Windows 7, Windows Vista or Windows XP. It’s nice that Microsoft chose to bundle this with the release preview, as they do go hand in hand. It makes laying the groundwork for a Windows 8 upgrade that much smoother.